Finally an "OUCHLESS" pin holder! No more -- "Reach for a pin in your pin holder and then pull the pin from your fingertip". 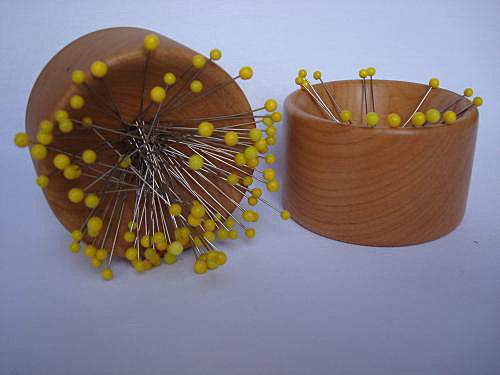 I have created an heirloom-quality wooden "Heads-Up Magnetic Pin Well" for sewing pins. When you place your pins in the cone-shaped depression of the "Heads-Up Magnetic Pin Well" you place them with the heads up where you can easily grab the head, NOT the sharp end (which will grab you!). I incorporated a powerful magnet into the base of the well to safely hold the pins in the well (note that in the photo the pins in the well on the left stay in place when the well is tipped on its side). 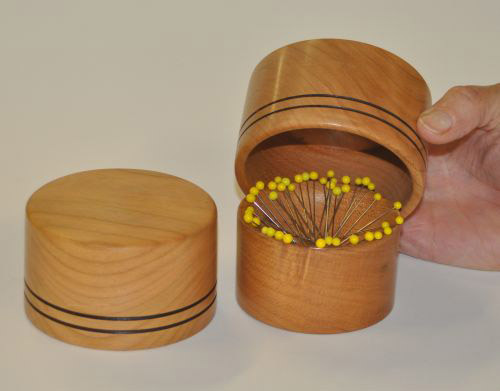 As with my Bobbin Caddies, the "Heads-Up Magnetic Pin Wells" are available in either Pennsylvania Black Cherry or Red Oak, your choice. They are approximately 3" in diameter and 1 ¾" high. They are heirlooms that will be passed on down the line of quilters in your family for generations to come. In the past I had a number of quilters tell me that if I had some way to keep the pins in a Heads-Up Magnetic Pin Well out of sight of their cat, they would love to have one! I now have a cover for the Heads-Up Magnetic Pin Wells that will keep the enclosed pins "out of sight- out of mind" for cats. The Kitty Kover is a handsome wood cover that fits neatly over the Heads-Up Magnetic Pin Well. If you wish to purchase a Kitty Kover for a Heads-Up Magnetic Pin Well that you purchased from me in the past, contact me to verify that the Kitty Kover will fit your pin well. The Kitty Kover by itself is $20. Heads-Up Magnetic Pin Wells and Kitty Kovers are available in Pennsylvania Black Cherry or Red Oak, your choice.